I trained as a Beauty therapist in 1999 I have gained extensive experience working in a gym, heath spa and salon environment before setting up my own business. Following the birth of my first son in January 2005 I launched The Haven – working from a brand new purpose built salon at our home. The Haven is home based salon, located in Charlton Kings on the main road to Cirencester – and there's plenty of free parking in the drive. Working for myself, I enjoy having the flexibility to offer the latest products – and I attend the industry shows every year to see the new trends and treatments coming through for the new season. For nails, I offer CND Shellac, Minx and Vinylux and for facials I use, Charlie Locks Professional Skincare System – a UK produced natural and organic skincare range. 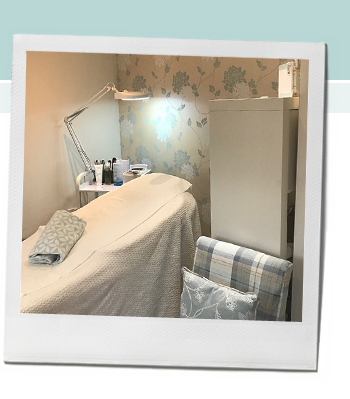 I offer all the 'essential' treatments including waxing, eyebrows and lash tinting right through to the more indulgent facials or massage – including Hot Stones massage – a real treat. The full range of treatments can be found at The Haven. I work flexible hours including two evenings (Tuesday and Thursday) until 9pm and Saturday morning every week. You can even book online at your convenience! I now take card payment as well as cash and cheque.